There is no one-size-fits-all solution to blood pressure. Patients come in all shapes and sizes and cannot be forced to fit a mold. 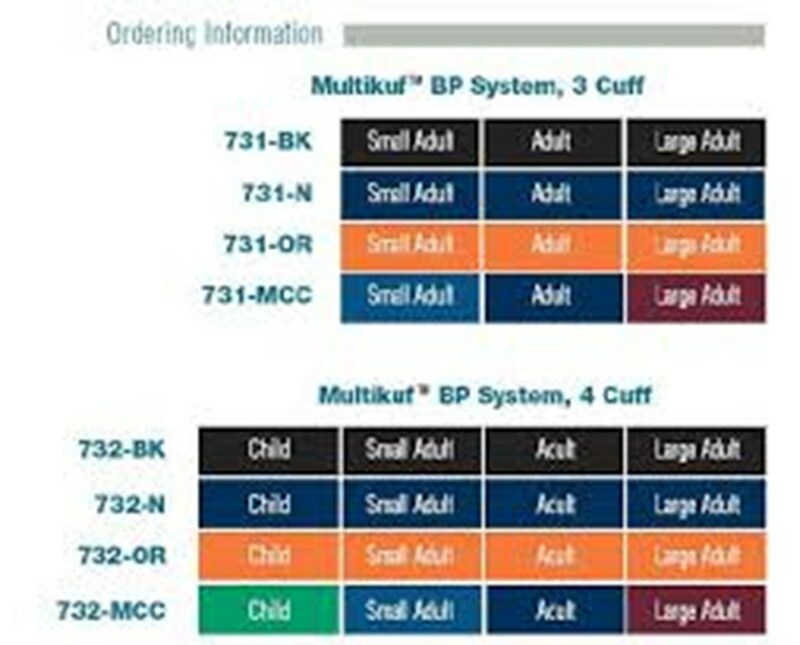 ADC's Multikuf™ 731 and 732 Multicuff Kit Systems address this problem directly, gathering a quality manometer and cuffs to fit every patient in one portable, easy-to-use kit. 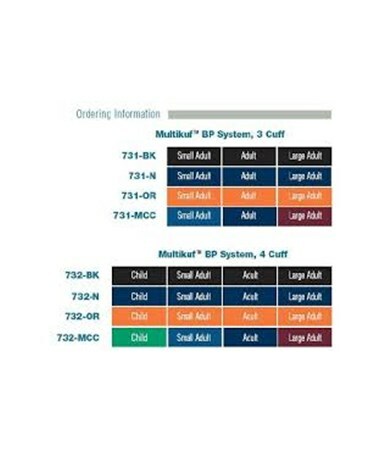 With the Multikuf™ kit, every clinician, practice, hospital, and facility can avoid over- or under-ordering of certain cuffs, complicated sizing, staff confusion, and incorrect blood pressure measurement. 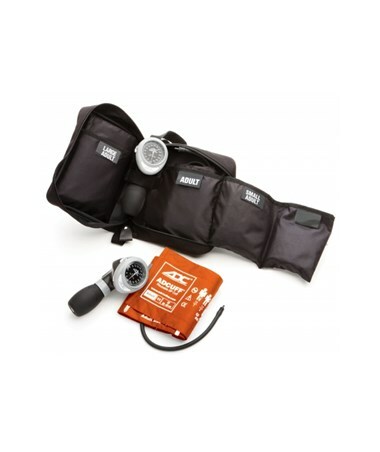 The compact size of these kits make them perfect for emergency and on-the-go situations. 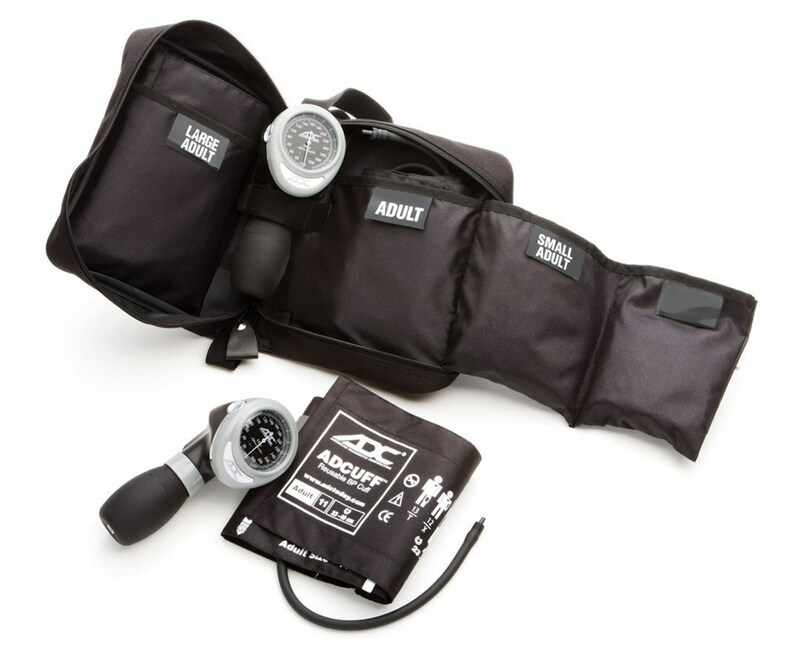 The Multikuf™ Kit features ADC’s Diagnostix™ 804 Palm Aneroid, an attractive, comfortable, virtually indestructable aneroid. The gauge's Japanese-engineered movement has been tested to 50,000 cycles, over 5 times the requirement under ANSI SP10, and is housed in a zinc safety cage within its rugged ABS casing. It boasts a versatile trigger-style ergonomically advanced design for ultimate comfort and easy, ambidextrous use. Its luer slip connector and integrated inflation system allow for maximum simplicity and speed in cuff changes and one-handed use. All of the components of the kit fit snugly inside a heavy-duty black nylon zippered case. Its multiple pockets keep the aneroid and cuffs securely in place, yet easily accessible. Measuring only 8" x 6" x 3.5", the case can be stored in most emergency boxes and trauma kits. The included AdCuff™ latex-free nylon cuffs boast the innovative Size Guide™ marking system to prevent mis-cuffing. Choose from a variety of colors, sizes, and quantities to suit every practice's needs; Multikuf™ is available in three- and four-cuff systems. The kit is available in monochromatic and multicolored options; order it with all black cuffs, all navy cuffs, all orange cuffs, or different colors for each size. Multicolored options include a green child cuff, royal blue small adult cuff, navy adult cuff, and/or burgundy large adult cuff. The suffix -BK corresponds to black, -N to navy, -OR to orange, and -MCC to multi-colored cuffs.